Paper mache, papier mache, paper paste. Whatever you call it – it’s certainly ooey, gooey messy artsy fun! It’s fall, and I’m making paper mache pumpkins. These sweet little guys also serve double duty and are awesome additions to a Halloween party buffet or holiday table. (This post contains affiliate links. Please see my affiliate disclosure statement for more information). I’m partial to making a mess with art. For years I taught an art camp called “Make a Mess”. Parents loved that their kids could go somewhere that wasn’t their own home and get messy with art. I honestly never cared of my son dripped finger paints onto the floor or got a stray crayon mark on the wall. That said, my house isn’t particularly fancy. If it was, I probably would have felt the same way and put the art mess off until my son was at school or a class. · What do you think will happen when you mix the flour and water together? · Why did the water get so thick when we started to add in the flour? · How is the new mixture different than the two ingredients that we started out with? · How dos the paper mache feel on your hands? · How does the paper mache smell? Now your little artist is ready to get crafting. Prep your work surface by covering it with a garbage bag or other similar barrier. It’s going to get messy! 1. Blow up the balloon. This makes the shape of the pumpkin. 2. Make a stand for the project. The stand allows the air to reach most of the paper mache, letting it dry without it sticking to whatever is underneath it. Cut two strips of card stock paper. Fold them into a circle and secure with tape. Use the balloon to measure the size. 3. Cut the construction paper into strips. I used orange and white, but your child is going to paint it so the color really doesn’t matter. 4. Dip the paper strips, one at a time, into the paste mix. Squeeze the excess back into the bowl. 5. Wrap the strips around the balloon. 6. Tear pieces or tissue paper. 7. Press the tissue over the construction paper-covered balloon. This adds texture to the project. 8. Place the pumpkin onto the stand. Let the paper mache dry overnight. 9. Paint the pumpkin orange. 10. Sprinkle gold or bronze glitter over the still-wet paint. 11. Glue on the googley eyes. 12. Cut a triangle nose and jack o’ lantern mouth from the black paper. 13. Glue these onto the pumpkin’s face. 14. Glue the cork to the top of the paper mache project. 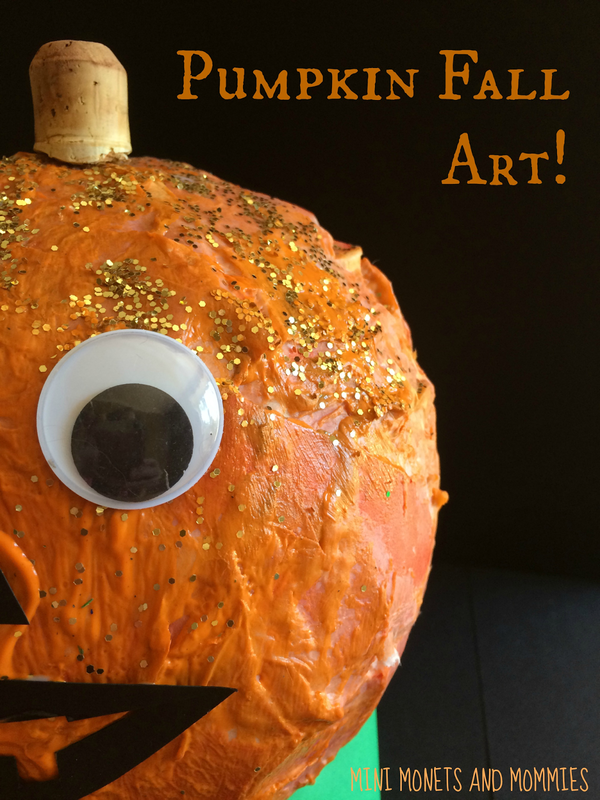 Are you looking for more fall themed crafts? Follow my Pinterest board for ideas! Follow Mini Monets and Mommies's board Fall Activities for Kids on Pinterest. 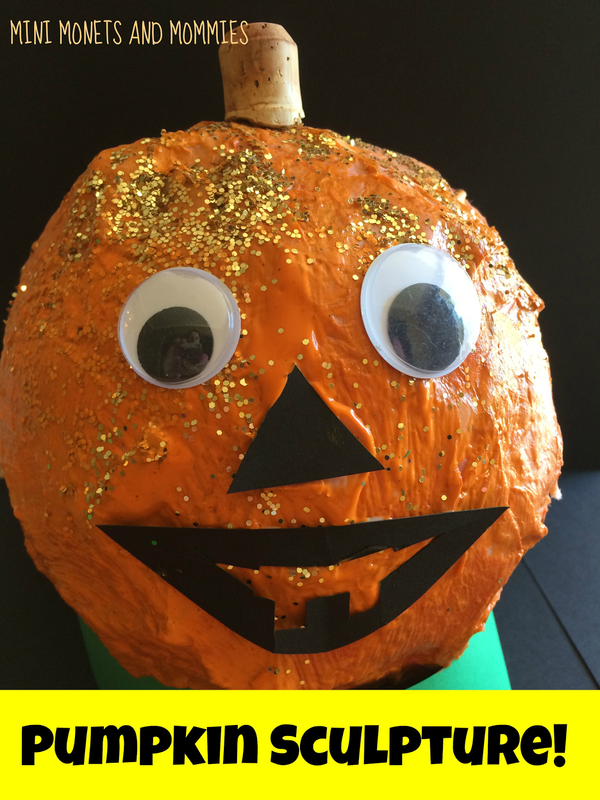 Your paper mache pumpkin came out so cute! I will have to try this with the kiddos. Thank you. It's a fun way to prep for Halloween. I love your pumpkin! 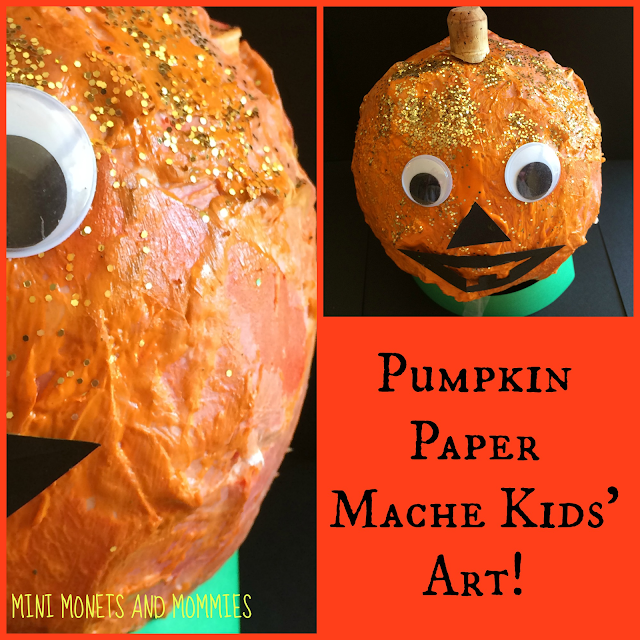 I still haven't tried paper mache with the kids yet but I want to after seeing your cute post! Thanks! It's messy, but so much fun. a great effect and beautifully illustrated. GREAT idea, my boys would love this!